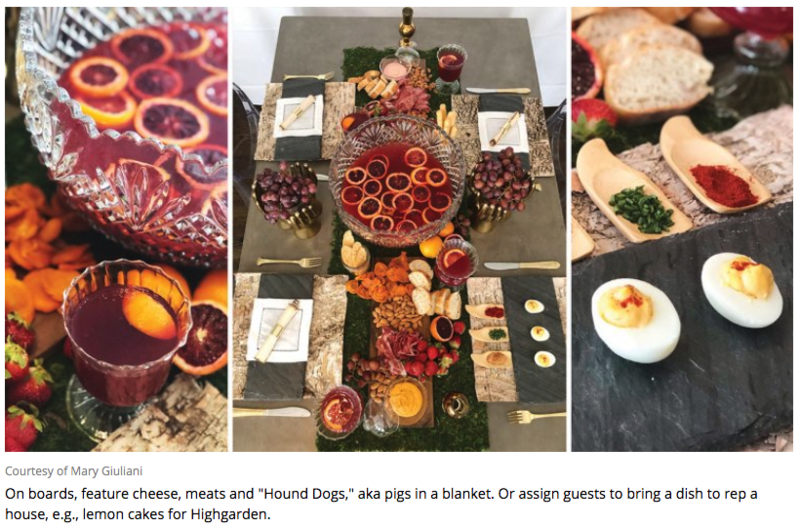 Mary Giuliani — NYC caterer to Bradley Cooper, Matt Damon and Tribeca — shares tips for hosting an impressive dinner pegged to the HBO drama’s final-season premiere. Hollywood caterer Mary Giuliani is known for her playful presentations, such as galaxy-themed doughnuts for Captain Marvel‘s New York premiere. “Every menu is well thought out and creative, every morsel is artfully prepared,” says Andrew Saffir, Cinema Society founder, of Giuliani. The event caterer for Bradley Cooper, Matt Damon, HBO and the Tribeca Film Festival released her memoir, titled Tiny Hot Dogs, on April 9, so THR reached out for Game of Thrones viewing-party tips in time for the show’s April 14 premiere. Giuliani gave suggestions that follow her patented format: Eat, Drink, Play, Recover. “Wooden boards are perfect for your Game of Thrones feast,” says Giuliani. “Arrange them down the center of your table like a runner and fill them with chicken wings and legs,” a nod to The Hound, who rode off on a horse with Arya Stark while gnawing on a chicken leg. In honor of Peter Dinklage, who plays Tyrion Lannister and is a well-known vegan, Giuliani recommends offering veggie pot pies or cauliflower steaks. Include a deviled-egg bar with three fiery toppings (red pepper, paprika and jalapeno) to pay homage to Daenerys’ three dragons. “Another great idea is to invite your guests for a Game of Thrones potluck,” Giuliani says. “Assign your guest a ‘house’ and they have to come up with dishes that best represent that family.” For example, the Tyrells of Highgarden could feature the lemon cakes that Sansa once refused to eat while there, surrounded by edible flowers in reference to the (now deceased) house’s lush gardens. “I love a punch bowl because I hate playing bartender all night,” says Giuliani. Blood oranges, symbolic of carnage and Dorne’s hot climate, work as a base ingredient. 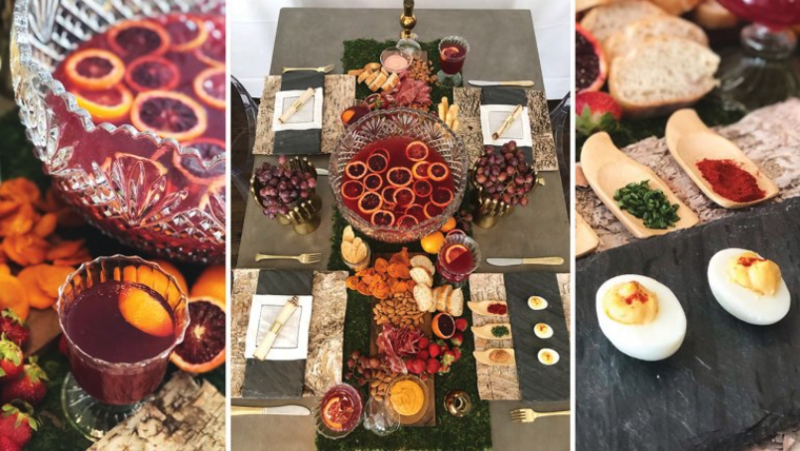 “Arrange the bowl in the center of your table and let your guests drink from it.” Use 3 bottles of cranberry juice; 1 gallon of orange juice (or freeze into ice cubes); 2 bottles of blood orange soda; 1 bottle of vodka or tequila; 1 cup of black cherries; 1 cup of sliced blood oranges. Garnish with edible gold and silver flecks (at craft stores and Amazon). Serve over ice.